Are moles destroying your yard in Portland, Or? Do you have new dirt mounds in your yard everyday? Don't stress about it anymore! We are here to help solve your mole, gopher, or vole problem for you! We are Oregon's Portland mole control company and can solve any mole problem large or small. Many homeowner's try and solve mole problems on there own without much success. This can be very frustrating and annoying especially when the damage continues to grow. We understand this and can solve the problem for you and remove the stress and frustration that can come with dealing with these destructive critters. There are a few companies out there that handle mole problems in Portland, Oregon. We believe that we are the best choice because we will never sell you anything you do not need and we do what ever it takes to solve the problem to your satisfaction. We offer competitive pricing with quality and professional service. We offer customized plans to help solve and control your mole problems. Portland mole trapping is the main method we use to solve mole damage problems. We have are the best mole trappers in the business and can quickly stop the damage by removing the moles. 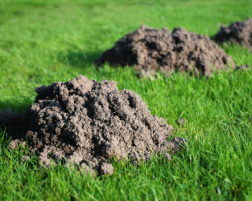 We have found that the most effective way of mole control in Portland is trapping and physically removing the pest moles. We have different types of traps depending on the type of problem we are dealing with. We are able to provide service for large commercial or agriculture properties along with smaller residential mole trapping jobs. Our customers satisfaction is always our top priority and if you have a problem contact us today for help. Gopher's can destroy gardens very quickly if not controlled at first sign of activity. Gopher and mole control can be confusing to many people because they have a hard time identifying the which damage is which. An easy way to tell the difference in some cases is that gopher's eat plant's and vegetation in your yard. Moles on the other hand mainly eat grubs and worms. So if you notice that your plants are getting eaten from underground most likely you have a gopher problem. Also gopher dirt mounds are different than moles. 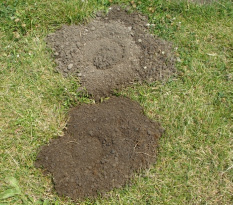 Moles will commonly create a large dirt mound about the size of a basketball, gopher's create smaller dirt mounds and you can many times see the hole to the side of the mound. Vole's in your yard can cause lots of damage and leave you having no idea what is causing the problem. Vole's are about the size of a mouse but have shorter hairy tails. They dig small golf ball size holes throughout yards and mainly along fence lines or any type of barrier. Vole's are very different that moles and gophers because they are smaller and can be more difficult to remove and control a problem. We are Portland's best vole control company and have handled large and small job's all being very successful. Patience and knowledge is the main tools used to control a vole problem. They are very shy animals that are rarely seen. If you have a vole problem we can help solve your problem and remove that stress from your life.